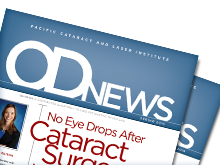 Founded in 1985, Pacific Cataract and Laser Institute is one of North America’s premier comanagement centers. At the heart of our organization is a steadfast commitment to the profession of optometry. We do not advertise or promote our care to the general public. Instead, we support your role as the primary eyecare expert. We’re here when you need us—for secondary medical care and surgery.